GMail vs Kerio Connect. 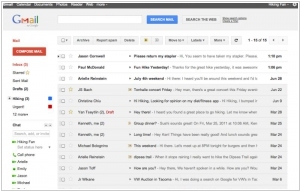 What is the best Business Email software? Kerio Connect is a commercial mail and groupware server developed by Kerio Technologies. It runs on Windows, Linux, and Mac OS X. Its features include encrypted access using SSL, anti-virus and anti-spam protection, native over-the-air handheld synchronization, webmail interface, connector for Microsoft Outlook and groupware features. Google continues searching opportunities to promote its social network Google+. At this time - at the expense of GMail. If you use GMail - know that now anyone on Google+ (even without knowing your email address) is be able to send email-messages to your GMail-inbox. But if you do not want to receive these new commercial/spam offers - you can disable this feature (in GMail Settings) or allow only your "Google+ circles friend" to email you. On the other hand, if you're on the other side of marketing - you now have the great opportunity to contact those people that you previously couldn't contact. You just need to find these people on Google+ before they disable this feature in their GMail settings.